Alder Springs, south of this point, marks the old Coloma Road, running between Sutter's Fort and Cul-Luh-Mah (Coloma). Established in 1847, this road was used by James W. Marshall in January 1848 to bring the first gold from Sutter's Mill to the fort. Later, travelled by thousands to and from the diggings, it became the route of California's first stageline, established in 1849 by James E. Birch. 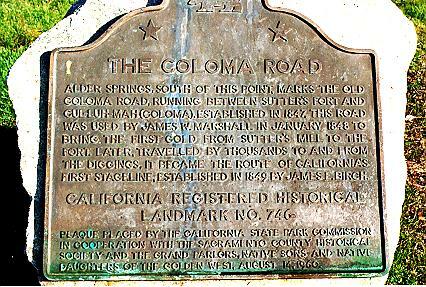 From Hwy 50, go N on Hazel Ave, take first road to right; plaque located in day use area, Nimbus Flat, Lake Natoma, Folsom Lake SRA.